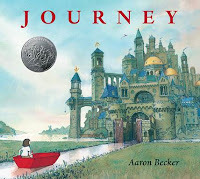 If you have not read the stunning wordless picture book Journey, stop reading this blog post and do that right now before you even continue -- not because this review will spoil the trilogy for you, but because Journey is a book everyone should read and you need to get on that. Return is the third and final book in the Journey trilogy and if you've read the other two books, it is just as stunning as you would expect it to be. It is a book that reminded me of everything I loved about Journey but this time the young protagonist understands the world in which she has drawn herself and is guiding someone into that world with her. In Return, the young girl journeys back to the magical land into which she drew herself for the same reason she did before: a lack of attention from her family. Only this time, her father notices and follows her into this magical world. The man is awed by the wonder and curiosity of this place, but he can't quite take it all in because he is focused on finding his daughter. When he does finally catch up to her, she has no desire to return home with him, which leads them on a magical journey fraught with wonder and peril. 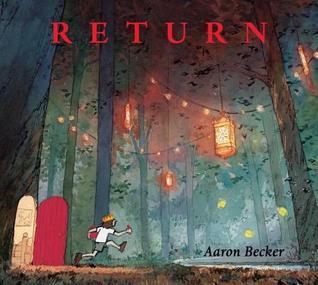 For lovers of Journey and Quest, Return is everything you want it to be: stunning illustrations, a compelling story full of imagination and fantasy, and characters that we find a way to care about despite the fact that they never speak. I can't wait to share this book with my students in the fall. 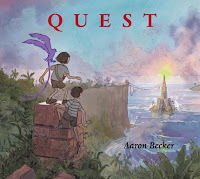 Thank you Aaron Becker for gracing the world with the gift of your stories and drawings. In anticipation of the release of Return, Candlewick Press is generously giving away to the readers of this blog a hardcover copy of both Journey and Quest to get caught up on the trilogy before the third books comes out. One winner will be selected to receive a hardcover copy of Journey and Quest.